This juvenile Gavialis gangeticus is a welcome ‘addition’ to the Grant Museum. G. gangeticus , commonly known as the gharial or gavial, is one of only two extant species (along with the so-called false gharial Tomistoma schlegelii) in family Gavialidae. They are only found in three rivers in India (Chambal River, Girwa River and Son River) and one in Nepal (Rapti/Narayani River) 1. In the most recent IUCN Red List of Threatened Species assessment of this species in 2007, G. gangeticus is listed Critically Endangered based on both chronic long term and rapid short term declines with an estimated population of fewer that 250 individuals in the wild. 2. The Museum has a few gharials in the collection but they are all skeletal apart from one very shriveled taxidermy specimen. 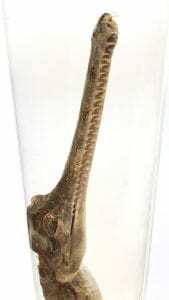 This specimen, now the sole preserved gharial specimen in the Grant Museum, is in a good condition despite its formerly cramped conditions, a dissected belly and some scale loss on the tail. Overall, it is a useful specimen to illustrate the species’ characteristic long, narrow snout (with perfect dentition), smooth epidermal non-overlapping body scales and dorsal osteoderms (bony plates). Animals removed from the jar during conservation. Armadillo not pictured. 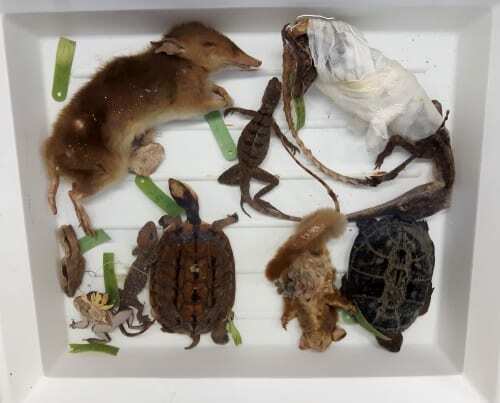 Removed from the jar were (clockwise from top left in image above): long-nosed bandicoot, Russell’s viper (head only – below belly of bandicoot), banded basilisk, gharial (wrapped in tissue), terrapin, squirrel glider, side necked turtle, brindled house gecko, Gunther’s frog, Boa constrictor (head) and a Southern three-banded armadillo (not pictured). 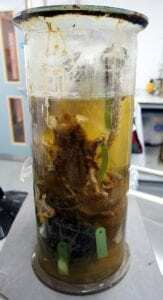 Following transfer out of the communal jar, each specimen was individually rehoused in a new jar with fresh 80% IMS (Industrial methylated spirit – alcohol used for preservation), ensuring their preservation for many years to come. Thus following this decant, the Grant Museum now has 11 new specimens suitable for display and with the potential to be used in teaching, research, family learning activities and more. I gotta bookmark this web site it seems very beneficial very beneficial.